This past weekend was my 35th wedding anniversary, and to celebrate my husband and I took a trip to a small historical colonial town a few hours away from Belo Horizonte called São João del Rei. We then took a short train ride to nearby Tiradentes, where they have a big annual food and culture festival at the end of August. Brazilians know how to celebrate! We had a great time, eating pork, drinking beer while munching cashews and peanuts, sampling food from the many outdoor booths, and generally just immersing ourselves in festive Brazilian culture. The chefs there treated me like a sister, even though I still know only a little Portuguese, and they tended to not speak English. So now you know why I haven't posted a blog here sooner (I left the computer behind!). I've posted a few photos at my flickr site. How does all this relate to Africa? I'm learning a lot about links among Brazilian, Portuguese, and African cuisine, from manioc (cassava) to cooking techniques. In the next day or two I'll share some of that info, so check back soon. On the African cookbook project front, I know I've been sent a Ugandan cookbook, and a Mozambican one is on its way to BETUMI. While I'm in Brazil, a colleague is manning the post office box. I'll update you on that front soon, too. I've spent the week savoring the cuisine of Minas Gerais, where we're based. Last Sunday was Brazil's Father's Day, and we were invited to celebrate with the family of Renato and Virginia Ciminelli: parents, brothers, sisters, spouses, and cousins--babies to teenagers. What a joyful, boisterous family (though there was a little tension over 2 opposing soccer teams--people seem to take soccer VERY seriously here). In Belo we've lingered over tiny cups of strong Brazilian coffee or cerveja (beer)--my husband is partial to Skol--while having animated conversations at outdoor tables. They're just coming out of their winter here, but it's shirtsleeve weather and lovely. Yesterday at lunch I had an excellent caipirinha. A Brazilian specialty, it's a lime, ice, sugar and cachaça cocktail (cachaça is made from sugar cane, but differs from rum). We've been eating at "kilo" restaurants for lunch, where you fill up your plate buffet style and pay by weight. So far I'm partial to farofa and plantains and collard greens or kale, and a wonderful white fish that might be called badeja, along with feijoada and moqueca (muqueca), a kind of wonderful seafood stew from Bahia. I gather there are lots of family recipes for feijoada, but ours was made from a certain kind of black bean (I'll get the nuances down in the next few months), cooked with pork (ribs, I think), some smoked and dried meat (pork?) and sausage, and I think garlic, but I get the flavoring ingredients for the collard greens, the farofa and the feijoada mixed up: I know there's onion and garlic in some, and oil (probably soy, corn, or canola), and the farofa is much drier and finer texture than West African dishes like gari foto, and had slivers of carrot in it. At some point I'll write more about the textures of gari (cassava or manioc meal), which ranges from coarse to fine, but I've not seen it as fine as Brazil's farinha de mandioca torrada used to make farofa. I understand Brazilians taught West Africans to make gari: it is said that in Angola the Portuguese forced the Africans on their plantations to cultivate cassava (manioc) and learn to make gari, and further north in Western Africa it was freed slaves returning from Brazil who taught Africans. At least that's what I heard. 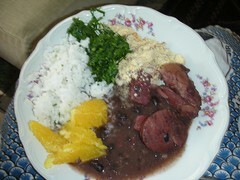 Feijoada is apparently eaten regularly on different days, depending on the region of Brazil, and is accompanied by white rice, the lightly fried collard greens, the farofa, and orange slices. I'll write more as I learn more! Feijoada definitely has an African feel about it. Many Brazilians also have a fondness for spicy red pepper condiments, and a little of one of those would be a fine accompaniment, I think.